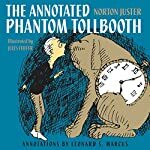 The Annotated Phantom Tollbooth by Norton Juster with annotations by Leonard S. Marcus. Review: Fifty years ago, a young architect who was given a grant to write a children's book about urban planning & design felt as if he was "about to be buried alive under a mountain of facts." During an escape he met a young boy who was bound and determined to find, once and for all, the largest number. Completely amused by the young boy, this architect was filled with new life and a new idea for a book. Little did he know his book would still be celebrated fifty years later! This young architect was Norton Juster, and his novel is The Phantom Tollbooth - a book that has not only been a staple in classrooms across the country, but has also been made into a musical! Today, Leonard S. Marcus has made a classic even better. The Annotated Phantom Tollbooth is the original story supplemented by an intriguing introduction and hundreds of annotations. The Phantom Tollbooth is an exercise in figurative language. It is the type of story that can be read over and over again at different stages of a reader's development and take on new meanings each time! Now with the annotated edition, the depth of understand a reader will have is astounding. Marcus' annotations are clearly the result of extensive research and richly support the text. He includes information that he learned as a result of interviews and his own analysis of the book. He also has incorporated actually copies of notes that Juster took when he was planning his novel. For example, in the story it says "Easy as falling off a log." Apparently Juster did an entire warm-up exercise to brainstorm idiomatic expressions that might lend themselves to comedy. A copy of his notes is included in the annotations! The annotations provide the reader with a much deeper understanding of the story and provide ideas for even further information. Juster uses verbal paradoxes throughout the novel, and Marcus offers a suggestion for further reading on such a literary style. As a teacher, The Annotated Phantom Tollbooth is essential to teaching the novel, however, even for the casual reader, the annotations will make an already amazing story even more thought-provoking and fascinating! We would like to thank Random House for providing a copy of The Annotated Phantom Tollbooth for this review. Have you read The Annotated Phantom Tollbooth? How would you rate it?